This weekend I was playing with a lot of neutral fabrics and lots of texture. This pile is for a quilt for a friend. I started it a while ago and needed to add a few more fabrics. It’s been fun to look for neutrals with texture to make this one interesting. I’ve got blocks pieced (I’m going with simple half-square triangles) and ready to start sewing into rows. Because of the really subtle shades in this quilt, I had to lay it out in the day with the natural light to really get it right. I tried one night (while watching MASH reruns on Netflix) and couldn’t do it well enough. Update: you can see the finished quilt here! Then, this gorgeous bundle arrived from Robert Kaufman. I’m teaching a class at a social media and creativity conference this week – using my tried-and-true table runner tutorial. Since we’ll have a wide variety of tastes there, I thought it would be fun to go with another neutral look that would appeal to a variety of people. Since Denim is a huge trend this year – and I’m really loving anything indigo at the moment – I though it would be fun to play with denims, chambrays, and linens. I’ve been eyeing Robert Kaufman’s denims and chambrays for while now, really wanting to make something with them, so I was SO excited when they were willing to sponsor this class! 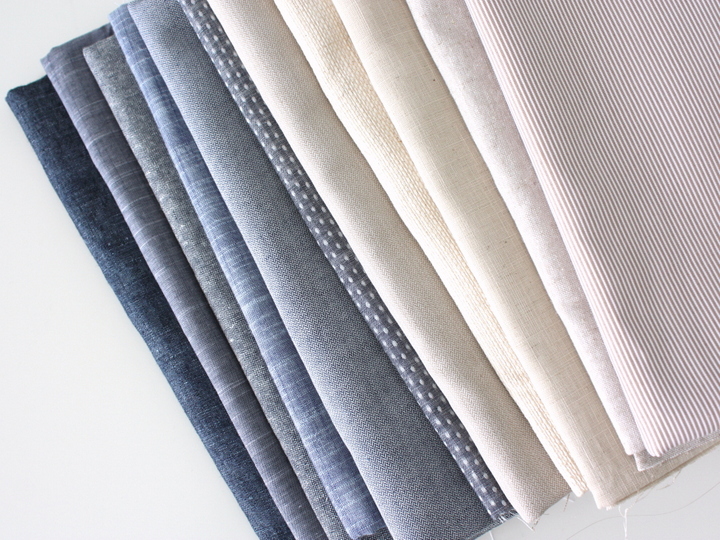 Above are a few of the textiles we’re sampling in the scrappy table runner. At the top are two of the Bradford Herringbone wovens in indigo and tan. Bottom right is the Essex yarn-dyed linen in flax (an old favorite) and indigo (a new favorite), and on the bottom left are two Chambray Union. The drape on both of these is amazing. They must make gorgeous garments. I’m going to need to buy some more and actually try sewing some clothes. These two are called Raw and Very Refined. I especially love the texture on the top one. This was a quick version of the table runner – and since I’m gearing this class for sewing-newbies, I didn’t do as much quilting as I usually do. But I kind of like the less-finished effect. Such a fun way to play with shades and textures rather than dramatic color contrast. I really want to make something more with all these pretty shades. If you’re looking for Robert Kaufman denims, linens, and chambrays, I’ve seen them at Fabricworm, Imagine Gnats shop, Fabric.com, or Hawthorne Threads. Essex Yarn Dyed linens found at Pink Castle Fabrics. Just looking at the pictures of the fabric, makes me want to touch them. Thanks for the view. this past weekend I made Jeni’s Giant Vintage Star using linen as my background. it was tricky! I love the look though. Your runner is really pretty! Lovely! I, too, am loving linen and indigos. I never thought of combining them with denim – it works beautifully! What a beautiful runner – it’s subtle but also striking. These fabrics are awesome and amazing! I would love to own them ALL . . .
What a great class idea for beginners! It’s a lovely project that your students will actually be able to use and proudly say they made it themselves. I hope you all have a blast learning together! I love the look of the denim paired with the neutrals… I often use dark denim with brights or wild fabrics but this was just beautiful! Really like the quilt of neutrals you are making for your friend. As a fairly new quilter some of the very patterned quilts do not appeal to me. I have never seen one like this. Please post the finished quilt. Is it hard to quilt over textured fabric? I’m excited to see how this turns out! I’ll definitely share pictures when it’s done. I’m going to have it machine quilted professionally, so hopefully they’re okay with the textured stuff. 🙂 But those machines are so big, they should be fine. Did you ever post a photo of the finished quilt? Where did you find all those lovely textured neutral fabrics? Beautiful!! 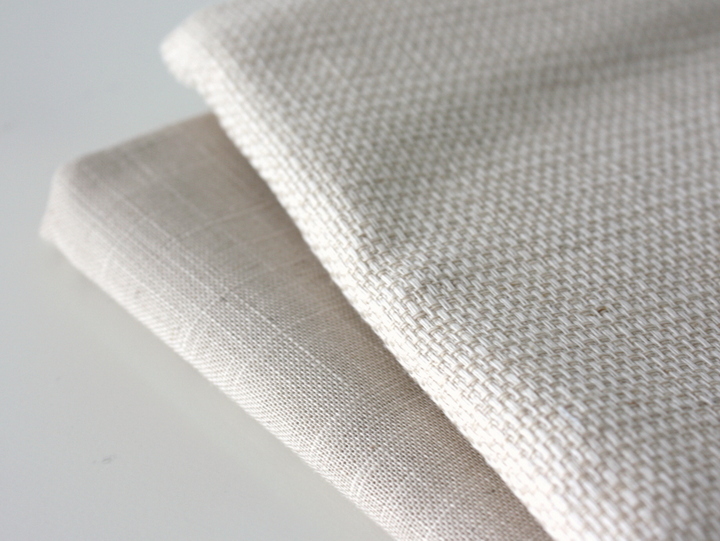 I just saw essex linens are in stock at the Fat Quarter Shop so I’m tempted to check them out! I love Robert Kaufman’s denim, such beautiful shades of blue with subtle patterns. Great work with that table runner, that would be perfect for beginners. Good Luck with the class! 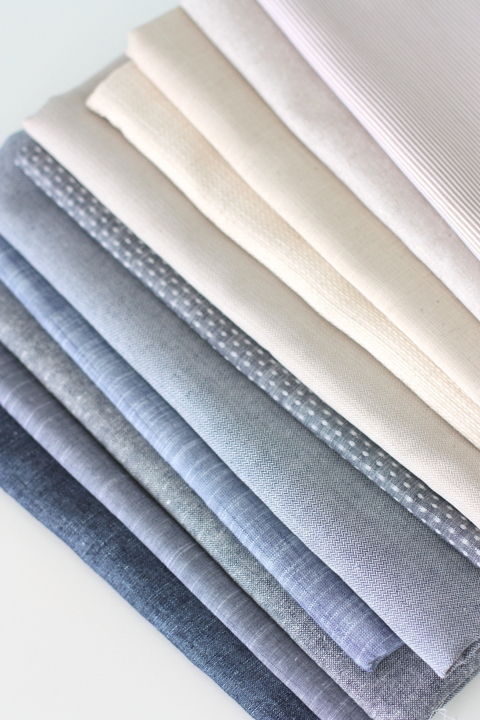 What a beautiful stack of fabrics Amy, you are truly an inspiration. Thank you. Hi Amy! I realize this is an older post, but I just came across it. Would you be willing to make this runner for purchase? Very nifty! I love the way the different textures look together, and I get they’re even more delightful to touch in person. Lovely fabrics in a lovely combinations! Could anyone please tell me how to purchase these fabrics as shown? Or how I may contact Amy to get more information? Please! I have searched and don’t know where or what to buy and every place Icall that carries Rovert Kaufman fabrics has no idea what I’m talking about. Just google Robert Kaufman Denim and you’ll find lots of retailers online. There are different weights in the denim department for RK from heavier denim to the really light-weight chambrays. Check the weight in the listings if you end up buying online.